Chegou o verão. Chegou mesmo assim como se chega de comboio, num momento não estava cá e no momento seguinte estava completamente aqui. O verão é a estação de que gosto mais, por todas as grandes memórias de familia, mar e viagens mas, também a que gosto menos, por todo o seu calor. Felizmente as casas antigas, como a minha, têm paredes de cinquenta centímetros que deixam o calor lá fora. O tricot torna-se lento, a costura delicada, com tecidos frescos, ligeiros. Tenho estado a tricotar uma Anker's Sweater um desenho da Petite Knit, que acho interessante, mantendo-se muito simples. No fundo a gola consiste numa sucessão de canelados com aumentos intercalados. No corpo fiz mais alguns aumentos para que seja larga em baixo. Estou a fazê-la comprida, quero sentir-me bem quente quando a usar. Ankers sweater, fio Brusca da Rosa Pomar. Escolhi um fio novo, da Rosa Pomar, e não podia estar mais contente. Este novo fio, o Brusca, mistura lã saloia com merino branco e preto e tem um toque muito bom, além disso a cor seduziu-me assim que a vi, talvez pela mistura de lã preta e branca. 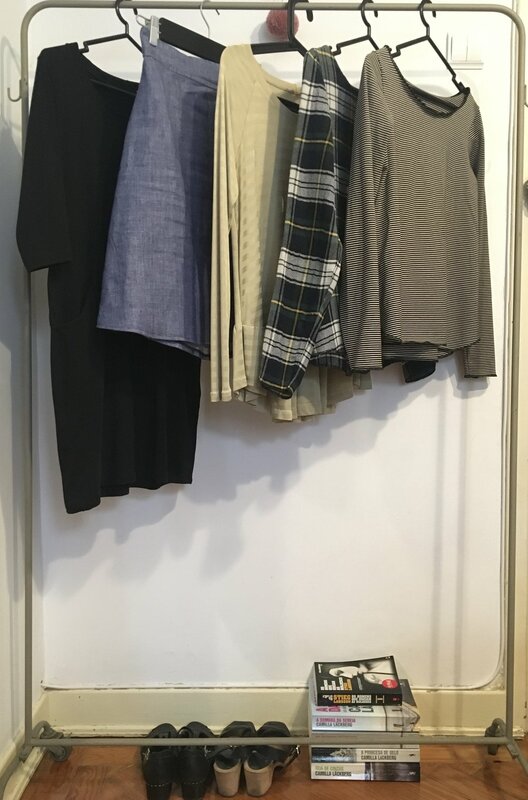 Comecei a fazer um vestido de verão, quero que seja largo mas com formas e escolhi um modelo da Deer and Doe que temos na loja. A construção do corpo do vestido é muito engraçada, e simples. Como cada metade da frente se divide em 3 triângulos há um jogo de costuras e simetria que é um pequeno desafio e impede que seja só mais um vestido de alças. Cortei a saia mais comprida para ficar pelo meio da perna. O tecido foi este. O verão é a altura da praia mas também da serra e como este ano choveu, há água nas ribeiras. Os dias na serra são longos e silenciosos e os banhos de água doce e gelada têm um sabor diferente. Procurar rãs e tartarugas é um entretenimento sem fim e há fresco à volta, fresco bom para umas carreiras de tricot, para um livro novo de um detetive antigo, para conversar devagar. A Inês desenha momentos que vivemos para o seu projecto de verão, tornando assim as memórias ainda mais memoráveis. Principio de uma aguarela da Inês. Na feira de Quelfes, Algarve. Some say there is no Global Warming, others pay careful attention to how the climate has changed in the last two decades. I was still at school when we first heard of the Ozone layer and how it was getting thinner, the way the sun was becoming damaging and how we had to protect ourselves by always using sunscreen. There were science fiction/catastrophe films about big snow storms affecting our world... well these movies usually take place in big American cities, but we could relate. Times have changed. And so has the weather. We can see it now happening around us. I live in the very south of Europe. Some people think it's always summer around here but it isn't. In fact it can get really cold in the winter. The things that are new to us are the small tornados we had this winter, the big storms, the very intense rains, the very late arrival of winter and now this cold in June. June is usually summer time in the Algarve and although I know it is normal to have 18ºC in the summer in Norway, we southerners are used to a solid 30ºC that will eventually become unbearable 38ºC or more in August. And this is where my Weekender sweater, designed by Andrea Mowry, becomes a need. When I finally finished this sweater, the winter was gone and the sun and warm weather were in. I thought it would wait in a drawer until next Fall but then I wore it at night, around the house and in the morning, taking the kids to school, and in the afternoon, while working, and always. This is the perfect sweater to have near by and throw over a t-shirt or knit dress. I could say I live in it now. I have knitted it in Malabrigo rios, in pure black. I wanted it to be a basic, something I new I would wear a lot. The only thing I wish I had made differently is the length, I think it would fit me better if it was a bit shorter. This was the first time using a three needle bind off and that was fun to learn. There is nothing very particular about this design, it is just a boxy sweater and that is what makes it so wearable and precious. This was my first real test knit. I had made a little test before but this was the first sweater and so, the first big thing. If anyone asked me for a good beginners knitting pattern I would surely mention this one. It is knitted in worsted yarn and it just flows out of our hands. 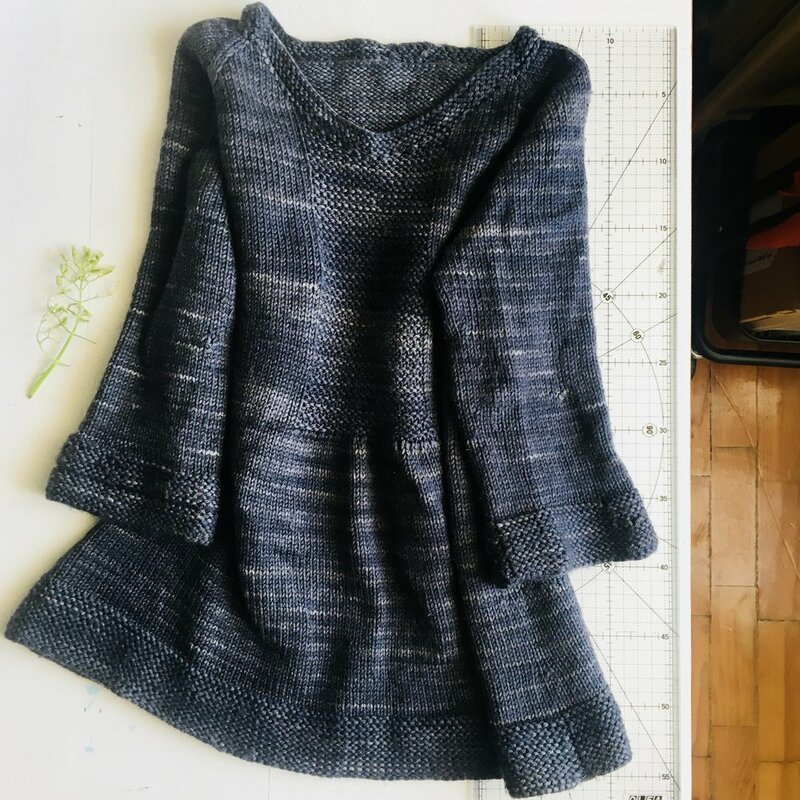 Since the South Bay Sweater I have tested for Sam Lamb again and I really appreciate how she builds her sweaters so that the neckline is simply perfect fitting the shoulders just right. I knitted the South Bay Sweater in Manos del Uruguay Alegria Grande, and the colour is Khol. This is a very easy knitting yarn and after washing it becomes softer and drapes beautifully. This is one of those staple sweater we keep using and don't even notice! A camisola South Bay foi o meu primeiro verdadeiro test knit, digo verdadeiro porque antes tinha testado uma pequena gola mas, esta foi a primeira camisola. Se me perguntarem se sei de um modelo de camisola para principiantes do tricot, espero lembrar-me de indicar esta. A sua construção é muito simples, mas não é aborrecida, porque o seu desenho nos obriga a prestar atenção. A South bay foi tricotada com Manos del Uruguay, Alegria Grande, na cor Khol. Usar um fio worsted e agulhas 4.5 mm facilita muito o crescimento da camisola e isso mantém o entusiasmo, porque a vemos literalmente, crescer. Este fio é muito macio e trabalha-se mesmo bem mas, foi depois de lavar a camisola que fiquei mesmo surpreendida, porque se transformou numa peça mais pesada e mais suave, com um drapeado lindíssimo que realça as pequenas pregas que nascem do peitilho. É uma daquelas camisolas que fazem o Inverno e nem notamos que estamos sempre a usar. Detalhes sobre esta camisola aqui. I always read blog posts about working from home or online. I read it in search for mysterious advice about how to make it perfectly. I never get an answer and neither will you when you read this. I work from home because there was a time when I had to close the brick and mortar shop. Times feel different now bur two and a half years ago it wasn't easy to keep a cute shop in a small southern town. I know it is the district capital but it is still a small town. Along with the so called financial crisis I had my husband really far away, in Costa Rica, and with two kids it seemed logic to stay home and be a full time mom. Although in reality all moms are full time moms wether they work outside the house or not. But thats what people call moms that don't work outside the house. Anyway, I didn't want to stay home and wait for my kids to arrive from school. So I decided to start a new kind of business, selling just fabrics and yarns and keeping the same shop name just because it had a little name and some followers. A base to develop and grow. I don't know if that was the correct move. I was not expecting to sell so much to foreign countries and I never considered the fact that maçãs d'amor is never understood or well pronounced or even connected to selling yarns or fabrics, or knitting or sewing... So, some bad choices were made, its normal, I learn as I travel. So this adventure began. At first the fabrics took prime place, because I am a sewing enthusiast and that was my favorite part of the job. This is one of the special things about building our own business, do I love what I do or do I do what I love?? It reflects me, my interests, maybe even my moods. And it doesn't mean I always notice that. I work alone. It is just me. It is always me. Even if the family is around and have opinions, the final decision, the instant image, the choice of patterns, colors, yarns, suppliers, budgets, prices, promotions... its me. But I have discovered that organization and planning are one of the keys to get some work done. For me it is all about the mornings. I take my kids to school, then come home, have a second coffee and sit in front of the computer. I get through the emails, the new orders, all desk work gets done. After that I usually prepare orders to be shipped. Some days I cut a lot of fabric, some days I just have to pack books or small adorable things like knitting needles. I go to the post office almost every day. Sometimes I think I should choose a day to do this, like Mondays, or Wednesdays but then I think of myself as a customer and how I like the things I buy online to arrive as fast as possible. I change post offices a lot, because I don't like to wait, or to be in the same place everyday, or maybe I'm just a little crazy. I started writing this post last September and as I read it now, almost 7 months after, I see how fast things develop when we don't pay attention. This year I have managed to organize work and motherhood. I have made an effort to meet people and not be isolated inside the house. I have re-organized all the fabrics and yarns, so that the studio isn't so confusing and my little online shop has grown, alongside with me. As with everything else in life, I believe that if we build things with love, they will grow.